As long as J and I have been together, she has talked about taking me out west to see the mountains and National Parks. She worked in Idaho for a couple of years after college and fell in love with the landscape. Eight years later, we finally had the opportunity. We had to go to Salt Lake City for a wedding, so we decided to extend the vacation and drive up north in to the Grand Tetons and Yellowstone National Park. After a gorgeous wedding at Blue Sky Ranch in Coalville, UT, we got up Sunday morning and said good-bye to every body before leaving the resort. Our plan was to make the four hour drive to Jackson, WY and spend some time in Grand Teton National Park before the sun went down. We left Park City just before 11:00 and started heading east on I-80. The route we were taking got us off the highway just past the Utah/Wyoming border in the town of Evanston and wouldn’t you know it, Evanston has a brewery. 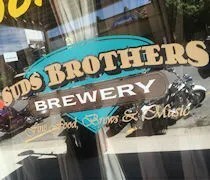 We stopped for lunch at Suds Brothers Brewery in downtown Evanston. The small brewery is on Main Street. It’s actually kind of easy to miss in this old downtown. The building only has signage in the window and looks very inconspicuous with metal siding and awning. 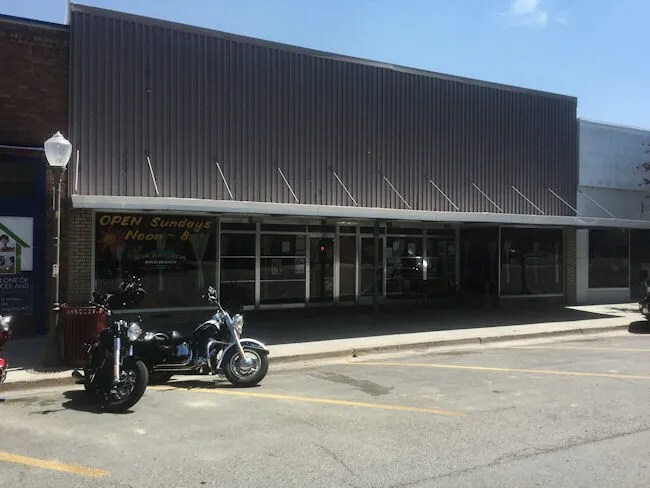 The website said the brewery opened at noon, but the “open” sign was already lit and there was a number of guys on motorcycles walking in as we found a parking spot in the angled street parking across the street from the restaurant. The restaurant has a couple of different dining room and a small bar that is sectioned off from the rest of the front dining room. The sign near the door said to seat yourself, so J and I grabbed a small table off to the right of the bar. A waitress noticed us sit down right away and came over with food menus. The beer options were written on a chalkboard hanging above the door in to a back dining room, and once again, there weren’t any big hoppy selections. 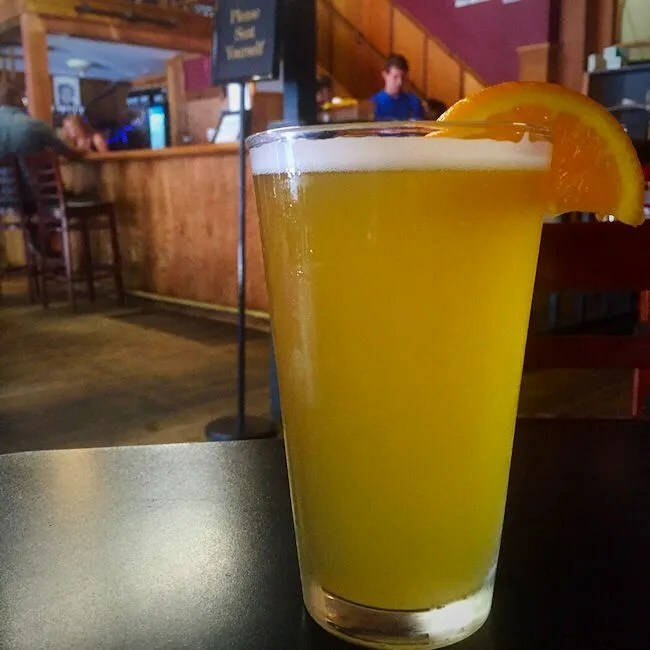 I tried to order the Bizzy Bee Hefeweizen, but they were out of that one, so I ordered the Orange Honey Wheat instead. This looks to be a new brew for them as there are less than 60 check-ins for the beer on Untappd. Just like the beer I ordered from No Name Saloon, this beer tasted a lot like Bell’s Oberon. It was a little cloudy, a little bitter, and served with an orange slice. After a heavy night of drinking at a fantastic wedding, the lighter wheat ale actually tasted refreshing. For our meals, J and I both went with old standby’s. I selected the Blues Bros Burger. 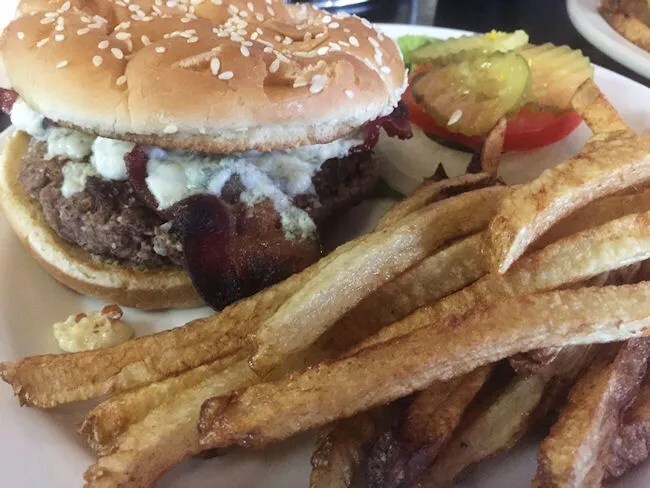 As the name implies, the sandwich is a half-pound burger topped with apple wood smoked bacon and bleu cheese. Now, this sandwich was delicious. It had a huge pile of bleu cheese on it that was held on by crispy strips of bacon. But, the real star of this meal was the french fries. Holy crap were these good fries. They were long, thin, fresh cut fries that were just soaked up the grease they were fried in. They were a little crispy on the outside and soft on the inside. These were the kind of fries that I’ve only had at hot dog stands in Chicago. J went with Chicken Tenders. 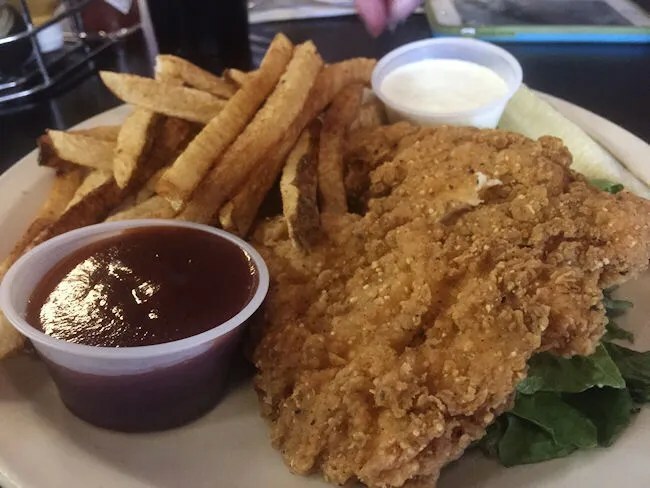 These large, juicy, breaded strips of chicken were fried up to a crispy golden brown and served with the same delicious golden, greasy fries. J was a big fan of both the chicken and the fries, but was nice enough to offer me some before we asked for the check. This meal was actually one of the cheapest we had at a sit-down restaurant on this trip, but it was still super delicious. The final tally, with tip, was just under $29. Suds Brothers Brewery wasn’t the biggest or the most well known brewery we visited on this trip and their beer selection was a little disappointing (the number and variety, not the taste of the one I had), but it was still a good stop along the way as we made our way north to check out some of our country’s national treasures.